AG: Has anyone seen Penfield’s Homunculus? 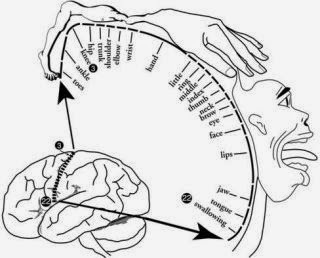 – the homunculoid picture drawn on the surface of the brain according to the areas of the brain that relate to the different senses? I think (the) mouth is enormous, actually. The mouth area is enormous. (The) forehead (is) very low, because there’s not much sensation up there. The visual? – I’ve forgotten how much area the visual takes up..
Student: It’s only for touch that he did that. AG: For touch? – Ah..
Student: There’s also motor homunculus. AG: That’s right. The thumbs were enormous. AG: Thumbs and (the) mouth. 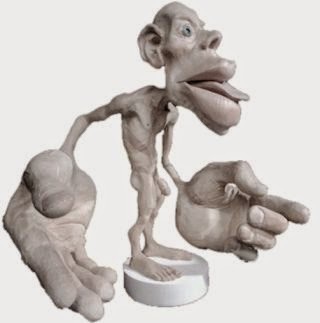 It was a homunculus made up of giant thumbs and (a) big mouth, and then…. Student: There’s a book in the library called The Mechanics of the Mind ( Editorial note: The Mystery of the Mind – A Critical Study of Consciousness and the Human Brain), where (they) made clay models.. So my reference is wrong on that as far as sight. But I think sight is generally the most common, largest sensation of consciousness. Sound is supposed to be the first and last – the first to arrive and the last to go. If you’re vanishing in the dentist’s chair, I think sound is the last sense to depart, when you go under on laughing gas. Anyway, I propose, generally, what can be seen, and most other poets do, or modern poets ((Ezra) Pound, (William Carlos) Williams, (Louis) Zukofsky) propose that area that you can see (“sight (is) where the eye hits”) as being the commonest place that people can find each other, (that is, in poetry), where they can communicate, where they can find matter that does communicate. Student: How would you answer the ancient objection that it’s nothing but imitation, nature’s just a type of mirror, an imitation of nature, (that) you have to have something extra. AG: Yes. That’s a… (after borrowing a cigarette) : Actually, there’s a long essay in the recent Arsenal [magazine] by Philip Lamantia, the Surrealist, precisely attacking me and (William Carlos) Williams and the whole development of twentieth-century poetry for having suppressed the Imagination in favor of the gross material sight. And particularly suppressed the inner voice, and his very precisely defined area of what is “inner voice”. So we’re going to try to have Philip Lamantia here next summer (1979 – [Editorial note – he didn’t come]) to teach Surrealism and to teach that area. William Burroughs’writing, incidentally, (in this context) is interesting. I think his writing.. he says (or has always said, since, at least the (19)50’s when I began enquiring)..Having been (at that time) working with (William Carlos) Williams, I began getting curious about the mechanics of Burroughs’ mind (and) I asked him how does he think? – And he insisted, from the very beginning, early (19)40’s, that he does not think in words. He thinks in pictures. Now, I find myself thinking in words (though, since doing a lot of meditation, there’s a little more pictorial element flashing on the mind’s eye). And then in Tangier, when we were spending a lot of time (together) in the early (19)60’s, (when he was writing certain chapters of Naked Lunch), I saw him at a typewriter and he was sitting there staring into space, as if in meditation, or he was just.. His hand was on the typewriter keys as if waiting for inspiration, waiting for the next thought, looking at the wall. And so I said, “What are you thinking about, Bill?”. And he said, “Hands pulling in nets from the sea” – “Hands pulling in nets from the sea in the darkness”. And I thought, “Gee, what a cosmic image! – like the cosmic hands of God bringing up the souls from the ocean of…”. And I said,” Where did you get that?”(thinking it was an idea – that is, a cosmic idea, a conceptual idea, from theosophy or something). And he said, “Oh, every morning before dawn the fishermen down at the beach are pulling in the nets from the sea, on the Tangier beach”. And he was just seeing their hands pulling in nets from the sea – Totally literal. So, in that sense, he thinks in pictures, and if you read his cut-upstuff (The Soft Machine, (The) Ticket that Exploded, (which we’ll go into), and Nova Express), you’ll see that his prose is a succession of visual imagery, generally. He has (a) good ear (as (Jack) Kerouac noticed). For Burroughs’ ear, Kerouac’s favorite line was “Motel motel motel loneliness moans along still oily tidal waters of East Texas bayou roads”– “Motel motel motel loneliness moans along still oily tidal waters …” – Kerouac picked that line out and said, “Bill’s a great poet. Like (John) Milton or something. He has this fantastic ear” – Which he does. That would be melopoeia for that one.